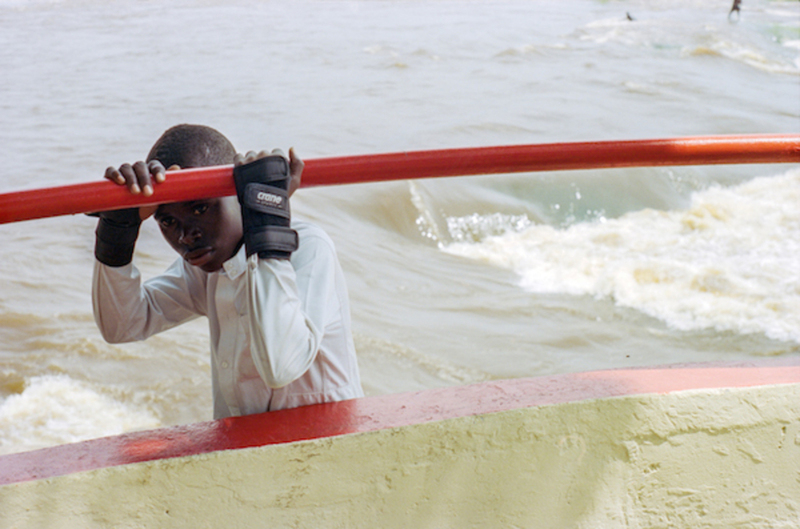 Teju Cole, Brazzaville, February 2013, 2017, archival pigment print, 20 x 24". Teju Cole is a novelist, photographer, art historian, and critic whose work often addresses the disjunctures between what is seen and what is known. His latest book, Blind Spot (Random House, 2017), weds the fragmentary essay form with photography, incorporating history, myth, and memoir to limn the connections and contradictions within images made during years of global travel. As discussed here, selections from the book, along with a second project begun in response to the recent US presidential election, will appear in the exhibition “Blind Spot and Black Paper” at Steven Kasher Gallery, Cole’s first New York solo show, which opens June 15 and runs until August 11, 2017. BLACK IS A DIFFICULT COLOR TO WORK WITH. A lot of artists avoid it. I remember being so impressed when I realized how subtly and effectively Henri Matisse used black in his work, how he simply treated it like any other color. I’m interested in the idea that blackness is not empty, that it is profound and full of information. Although I initially included images by Kazimir Malevich, Julie Mehretu, and other artists in my early conception of Black Paper, an ongoing work, I ultimately decided to use only my own photographs. Black Paper is not only a response to the last six months, but a highly individual response; I was not only playing with the chromatic presence of black in photographs, but also doing it from the point of view of a black person. I first conceived Blind Spot for an exhibition in Italy entitled “Punto d’ombra,” or “Shadow Point.” I had to find a form that would work equally well in both the gallery exhibition and the accompanying book. I have always been interested in the complications that ensue when images and texts meet. What work do I want images and words to do in my practice? Blind Spot is, in some sense, the most direct approach to this question I’ve taken so far. On one page you have text, on the other a photograph. I did not want to make a photobook that was simply, “Here are my travels.” In the course of the six years I worked on the project, I asked myself what I wanted to say about the terrain and history of each place I encountered. At some point in the journey I found this form for it, this alternating form, in which I would place an implied voice-over on each image. A big part of the sensibility that went into Blind Spot came from film, specifically documentary films like Chris Marker’s Sans Soleil. This is why I use the term voice-over: it seems to sit a little better than simply caption. A caption is a standard thing that’s supposed to do a fairly predictable job of elucidation. A voice-over suggests something a little bit more digressive, something weighted with a certain intent, but an intent that isn’t always simple to pin down. Although there are twenty-five different countries represented in the book, there is a kind of uniformity of line in it—and a uniformity of palette. This palette comes from shooting with 35-mm film: I recognized that film served the project best because of how it forces a certain slowness and a way of looking at things meditatively. On the other hand, most of the shooting for Black Paper was done with a digital camera because of its reliability in low light and at nighttime. I let each given project suggest its own best tools; I try not to be doctrinaire about it. Instagram had a profound influence on the eventual outcome of both of these projects. The length of the text in Blind Spot was partly shaped by writing on Instagram. One feature of the application I’ve made use of is the possibility of switching off comments. I don’t really want to know what people think of a work that is still being formed. Rather, I want Instagram to take me through the process of seeing the work being seen. The mere fact of having shown a particular picture to someone else helps me figure out my own critical response to that image. Of the photographs I have taken since November and tagged #blackpaper, I used maybe half in the printed, physical iteration of the work. It now exists as a massive multipart image on a wall, about seven feet long and four feet wide. Instagram helped me figure out which pictures were strong enough, and which I needed to discard. There is always tremendous activity that leads to the formation of a landscape. In the aftermath of violence, things take on a placid appearance. I’m interested in the oblique ways in which we have to respond to atrocity, since the violence isn’t always apparent. How does what we know relate to what we can see? Black Paper is a project I started in response to the US election, but also in the wake of having finished a book. The photographs in Blind Spot are bright. There is daylight. The complication—the darkness—is in the voice-over. The photographs themselves are legible and fairly artless in this kind of “photographing democratically” tradition that comes from William Eggleston. When I started to do Black Paper, the photographs became dark, moodier. They were less conceptual. Black Paper is actually more purely visual as a project: What I want you to see is in it, you just have to really look at it. The shadows are active. The pictures themselves contain a lot of information. I started out by including a lot of text, almost like a continuation of this technique from Blind Spot. And I’m going to use texts for future iterations of the piece, but for this first stage of the work, I wanted to just have a cluster of images speaking in that shadowed and emotional way. Later, I might add elements like projection, performance, sound recording, and video. We’ll see. What I’ll say for now is that I want Black Paper to be the general rubric under which I consider my own personal response to this ongoing apocalypse. I continue to gather images for the project. The crisis is ongoing, and therefore so is the responsive work.